I met Tara Betts at this poetry conference, Furious Flower, back in 2004. She and I had a few common friends. 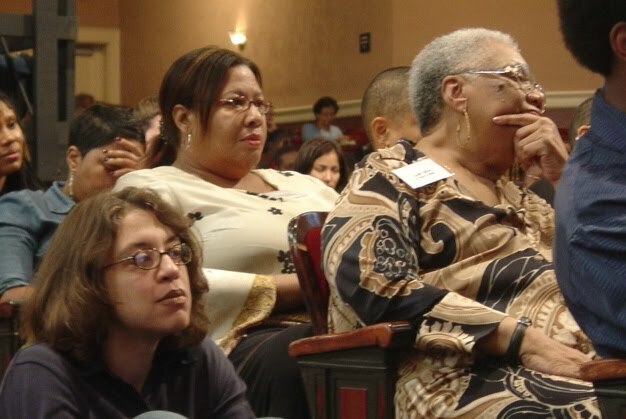 At that time, I also met the late poet Lucille Clifton. During one of the readings at the conference while taking photos, I turned and saw Betts sitting in the isle near Clifton, so I snapped this photo. Because of the angles and all, the photo didn't come out like I wanted. But still glad I caught the moment, you know? Since 2004, I've tried to keep an eye on Betts's writings. Caught her poems published here and there. I also caught audio clips of her reading online. Among other things, she's a talented performer. Check out some of her work on her myspace page. Last year, she published her volume Arc & Hue. As part of our multi-threaded commentary on select poets, we'll write a series of posts on Betts's work in the coming months.